There's much going on in and around Hoboken this holiday season particularly around land use issues which should be of interest to all. Earlier this month, the first of a series of public meetings were held to reveal and discuss five concept plans developed around the Rebuild by Design competition the City/Region won in June 2014. In the past week there has been much debate over the five concepts ranging from highest impact protection to lowest impact protection. One concept in particular which appeared to be the most economical and lowest impact protection of the five, called for a wall down Garden Street from 15th to 12th street. When I first saw the plans, I had two thoughts: 1) there will be flood waters on one side of the wall; and 2) any kind of wall in an historic neighborhood would be unattractive. HOWEVER, I was open to the debate given these are concept plans and that public discussions by the Community Advisory Group (CAG) called for a "hybrid" plan. A hybrid plan would take ideas from the current 5 plans and mix them with each other to create a new concept plan. It would refer to different combinations of alignments, like natural berms, and other types of deployable structures around the perimeter instead of hardscaped walls in a residential neighborhood. Since being elected in 2007, my council colleagues, the Mayor, and I have hosted, I believe, more community meetings for projects more than anyone in Hoboken's history. Prior administrations and officials would have decided on a plan in a backroom deal. This is by far not the case with the Rebuild By Design project. Since the early December unveiling of the plans, the Administration with the CAG, and project professionals have hosted a series of public meetings. The debate has been engaging and thought provoking. It's important to note this is the beginning not the end of the process. I am confident it will result in new alignments which not only protect more of Hoboken, but cease to divide our community. These plans are in the comment period with the Department of Environmental Protection. It's important that we as a community as a whole dispute the alignments that will cause harm in many ways to other neighborhoods. 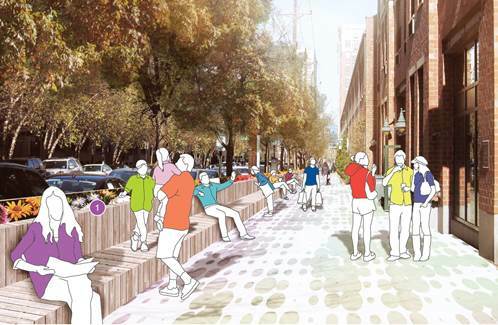 This includes Concept A which depicts the "Garden Street wall." We must also call on the DEP to expand the CAG to be more inclusive. Comments can be submitted via email to rbdhudsonriver@dep.nj.gov, or mailed to David Rosenblatt, Director, Office of Flood Hazard Risk Reduction Measures, 501 East State Street, Mail Code 501‐01A, PO Box 420, Trenton, NJ 08625‐0420. Please register your concerns so that your voice can be heard about these plans. consider in the second ward in uptown Hoboken.